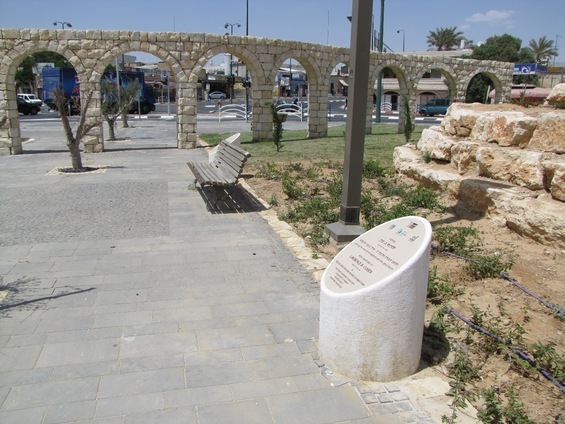 Two beautiful new pillars were erected in Beer Sheva, Israel. The first on behalf of Zone President Larry Cohen and the New England Board of Directors for their dedication and the other is a personal donation in honor of Cohen. Cohen is a strong champion of the Be’er Sheva River Project, having already raised millions for a promenade along the river walk. Be’er Sheva, known as the Capital of the Negev, is home to 200,000 residents. Through it runs the Be’er Sheva River, a muddy trickle of water except on the few days a year when flash floods run down its banks. The city’s image has mirrored the landscape. Despite its historical significance, many have seen Be’er Sheva as a stagnant backwater, culturally and geographically isolated from the modern miracle of modern Israel. Jewish National Fund, through its Blueprint Negev initiative, is providing the means for a renaissance for this Negev metropolis. The centerpiece is the Be’er Sheva River Park, a massive water, environment and economic development project that is transforming the riverfront into a 1,700-acre civic paradise.